In painting, as in brewing, there is no possibility of cheating. It is either good, or it isn’t. Luckily for folks in the Mat-Su valley, it seems we have a healthy crop of good painters, and luckily for us here at the BRBC, these talented artists are bringing their work into the taproom (where you can also find tasty fresh brews, btw). That’s right: this past summer we set up an exhibition space for local art in the taproom. On the First Friday of each month we have a New Art debut party, where the artist comes down to meet the folks in the taproom and talk about their work, which hangs for the rest of the month in the taproom. The art is for sale on a first-come, first-serve basis, but even if the whole exhibition is snapped up at the debut, the whole collection stays on the wall the entire month for all to enjoy. In our first month we had Maria McKiernan come down to kick things off. Maria’s exhibition consisted of ten original works rendered in oil, charcoal and pencil, which all depict local scenes from Hatcher Pass and Seward. Then, in August, our First Friday debut featured Terry Phillips, whose show offered a range of works focusing on local landscapes and still life paintings. 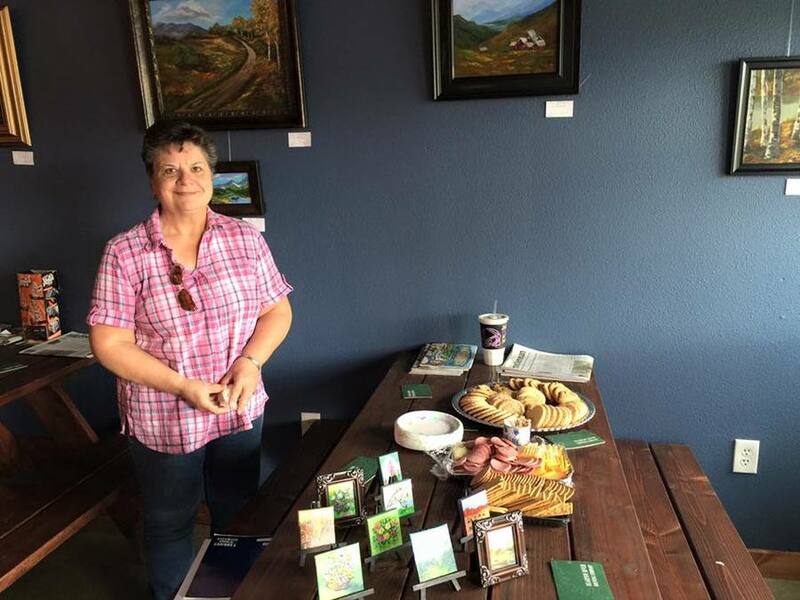 Most recently, on the First Friday of this month, we welcomed Michelle Cornelius, a versatile artist who enjoys photography, pottery, and sculpture, in addition to working in graphite pencil, colored pencil, pen/ink, charcoal, soft pastel, oil pastel, acrylic, gouache, watercolor, and oil. Michelle’s exhibition will hang in the taproom until the First Friday of October, when we will introduce yet another local artist, Judy Vars, and from then onward a new talent from our community each month.